This entry is part 9 of 9 in the series CheeseWeb Tastes Cheese. 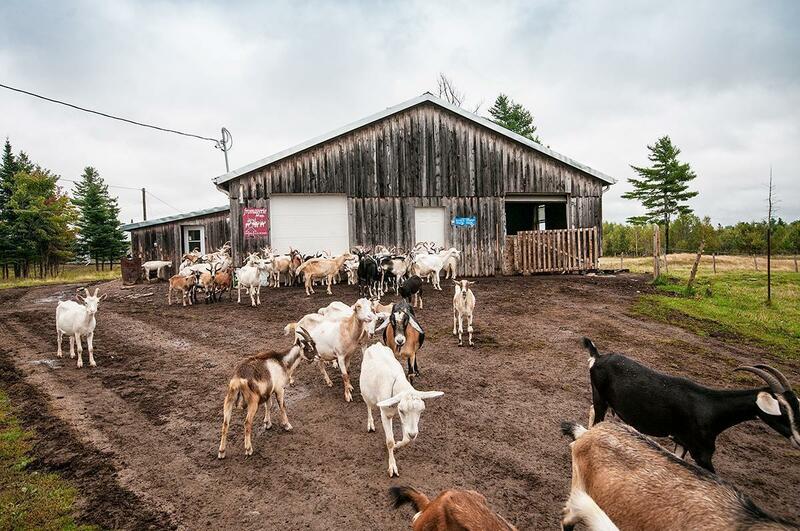 We visit Fromagerie Au Fond du Bois, a goat cheese farm in Rexton, New Brunswick, making artisanal European-style goat cheese, in Eastern Canada. We’ve been thoroughly enjoying rediscovering my home province of New Brunswick over the past year, but that doesn’t mean we aren’t missing some things from our other home in Belgium. One of the most notable is good cheese (and you know for us that is a big problem). We were spoiled for choice in Brussels, as even the supermarket shelves were brimming with cheeses from France, Spain, the Netherlands, Italy, and more; to say nothing of the excellent Belgian cheeses. Then there were the incredible Fromageries whose enticing aroma would hit you as soon as you walked in the door; a veritable candy shop for us cheese addicts. We even had artisanal cheese delivered to us each month from our favourite small farm. When it came to cheese, we were totally spoiled. Here in Canada, we’ve been known to refer to New Brunswick as ‘the cheese desert.’ We have a hard time getting excited about the mass-produced, plastic-flavoured cheese available at our local grocery store and artisanal cheeses are rare and expensive. The rule stating all large-scale cheese production must be pasteurised has done nothing for the cheese scene on this side of the ocean. But, luckily, even the desert has an oasis. We happened to discover ours at the Boyce Market in Fredericton, NB. Tucked into a narrow hallway was a refrigerator case stuffed with beautiful goat cheeses from New Brunswick producer Fromagerie Au Fond du Bois. We shopped. We ate. We fell in love. 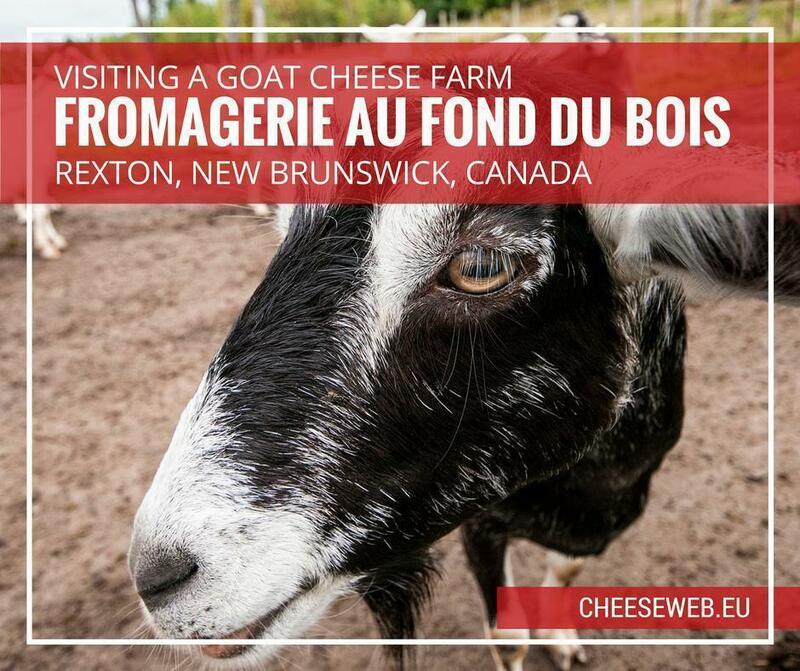 So when we saw Fromagerie Au Fond du Bois was participating in the annual New Brunswick Open Farm Day, we decided to make the 2.5-hour trek to Rexton from Saint John. Cheese and goats – how could we say no? Our first hurdle was finding the farm. 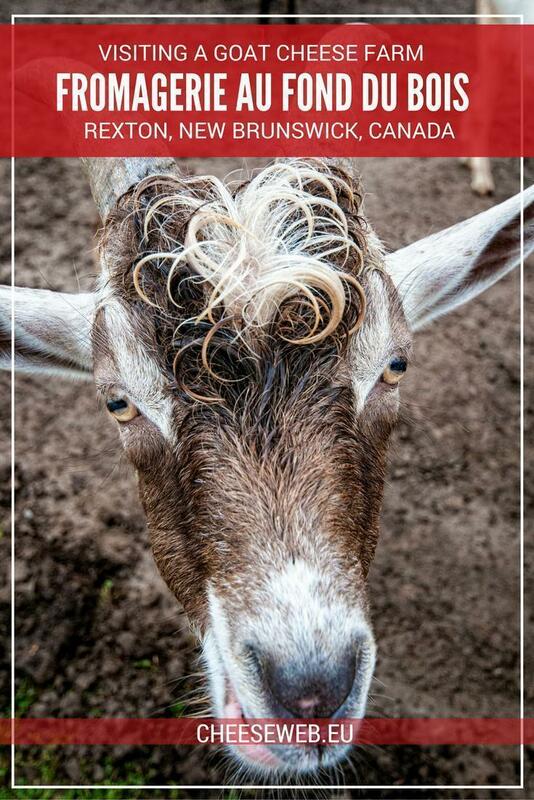 The village of Rexton, NB, is near Richibucto, which makes it easy to visit if you’re staying at Kouchibouguac National Park – easy if you can find the farm. Even with the address in our GPS, we drove past the farm’s driveway several times before we spotted it. The problems were twofold – the farm’s sign was set back from the road and obscured by overgrown brush and the driveway listed the house number of a neighbour, but not the farm. Luckily, on our third pass, we spotted the sign. The fromagerie is aptly named. Au Fond du Bois, or ‘in the middle of the woods’ it certainly is and if you are precious about getting your car muddy this may not be the farm visit for you. Our trusty Subaru was up to the task, however, and we parked beside a few other intrepid visitors and headed towards the barn. We peeked inside the wooden barn and spotted a few goats enjoying a nap in the hay. But it seemed the majority of the farm’s herd were off foraging. 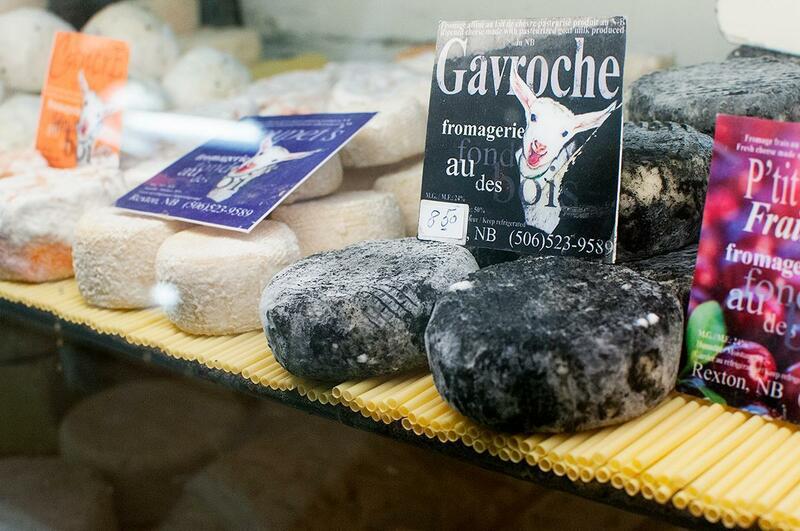 We made our way to the fromagerie and stepped inside the tiny shop to wait our turn for access to the sample platter. The small space was packed with visitors while the owner rushed back and forth filling orders. We admired the photos of some of the farm’s goats while we waited. It wasn’t long before we had the shop, and its owner to ourselves, as the large group left en masse. We restrained ourselves (barely) from diving into the cheese platter face first as we learned about the fromagerie and its charismatic owner. It turns out, no matter where we go, Belgium follows us – this time in the form of Didier Laurent, who left Belgium in 2012 looking to take over a small business in Canada. He discovered Fromagerie Au Fond du Bois, started by a Belgian-French couple from (our favourite region) Auvergne, and with no knowledge of farming and cheese-making, decided to take the plunge. Of course, there were some growing pains, Didier told us, but through trial and error, he discovered making goat cheese in an artisanal way was his calling. He’s not the only one; Fromagerie Au Fond du Bois has won numerous national cheese awards, and we could taste why. You don’t have to travel all the way to Rexton to get your hands on Au Fond du Bois cheese. As we mentioned, they are a mainstay of the Boyce Market in Fredericton. You can also find them at the Dieppe Market year-round and in summers at Bouctouche, Shediac, and (hooray!) Saint-John. Here at CheeseWeb, we love goats! 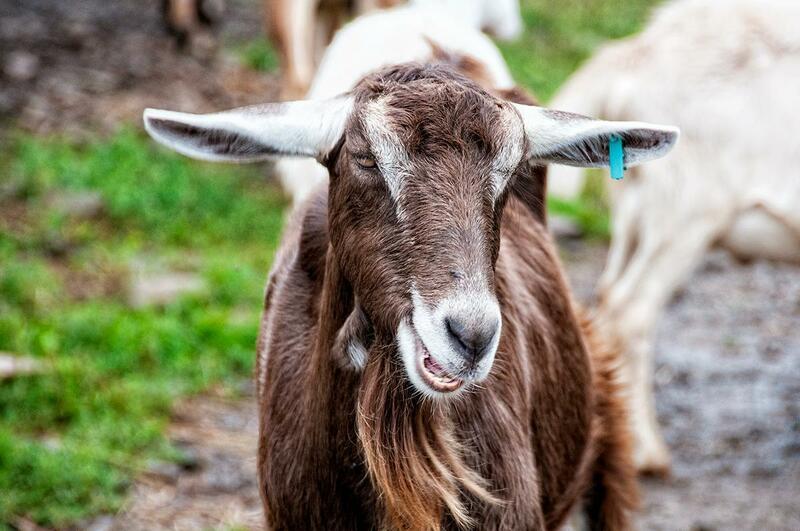 But there’s one great reason to visit the farm for yourself – the amazingly friendly goats. We’ve visited a number of goat farms over the years, and normally the goats are tolerant of my affections at best. 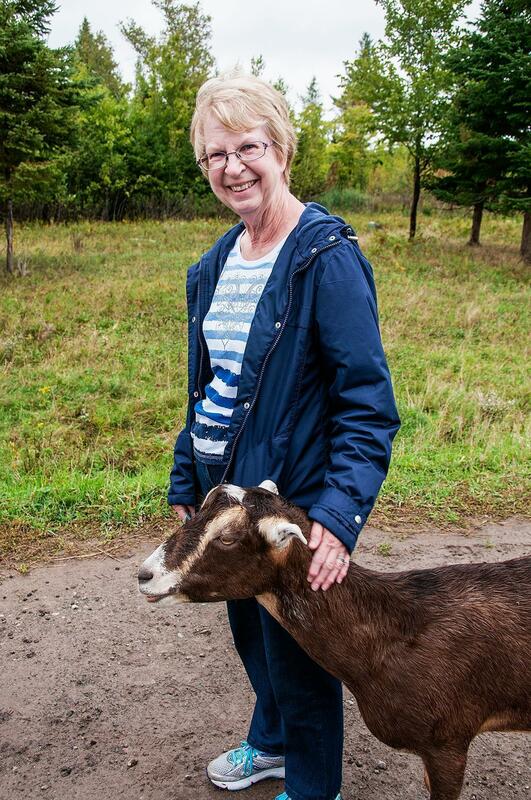 But the goats at Au Fond du Bois seem to love people and attention. 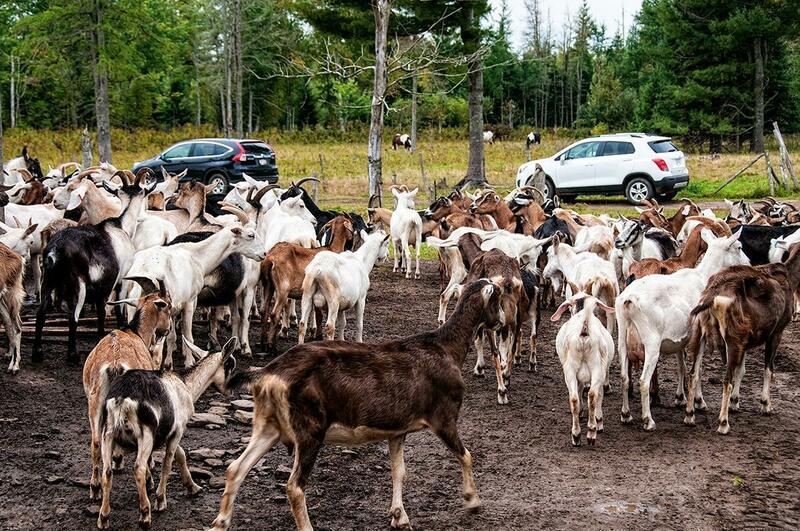 When we left Didier to tend his shop, we stepped outside into an enormous gathering of goats. 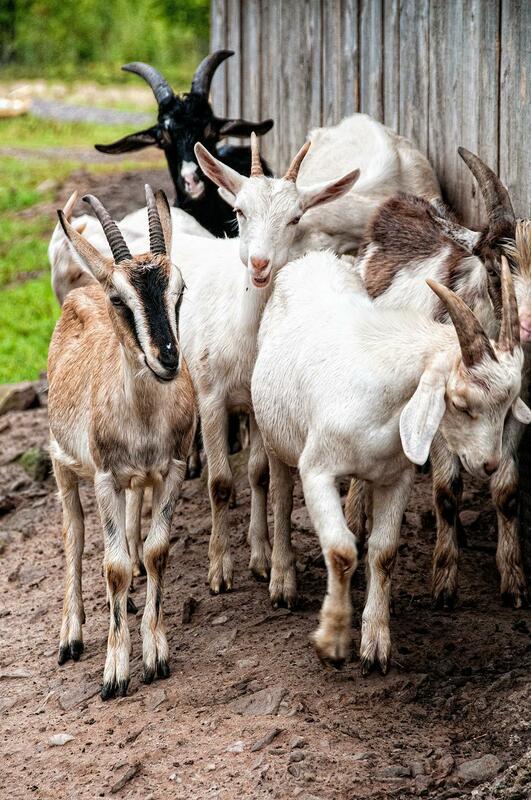 Didier maintains a herd of 200 (give or take) goats of five varieties: Nubian, Alpine, Lamancha, Saanen, and Toggenburg. The goats are free range in the truest of senses. 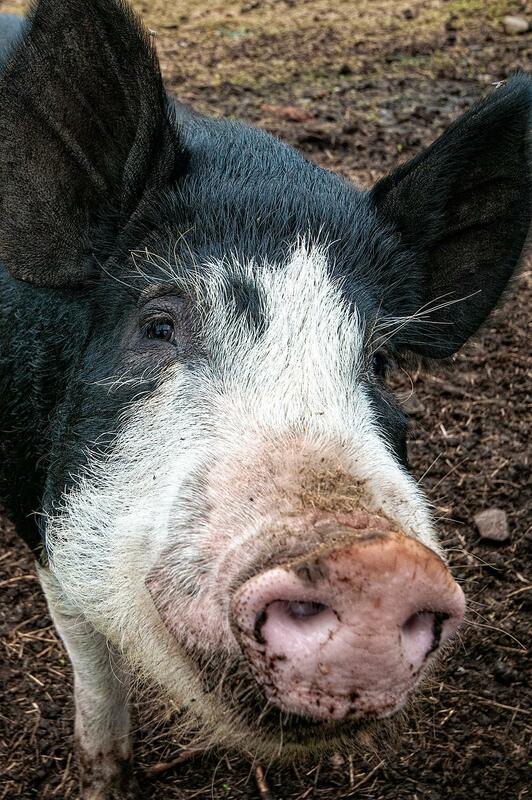 They have over 267 acres to roam, explore, and eat. Didier likes his goats to be outside as much as possible, even if that means they produce slightly less milk. Happy goats are more important and these goats are definitely happy. 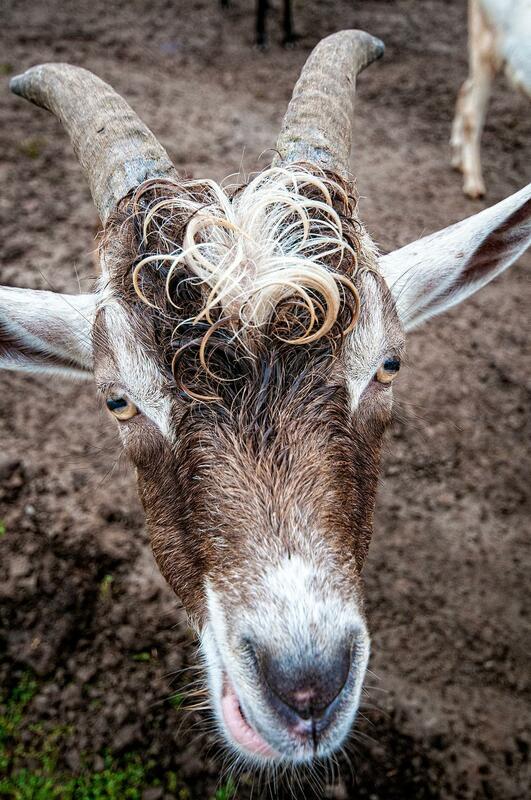 This goat has a rockin’ goat-tee! They crowded around us for head scratches, pats, and to see if we had anything interesting in our pockets. 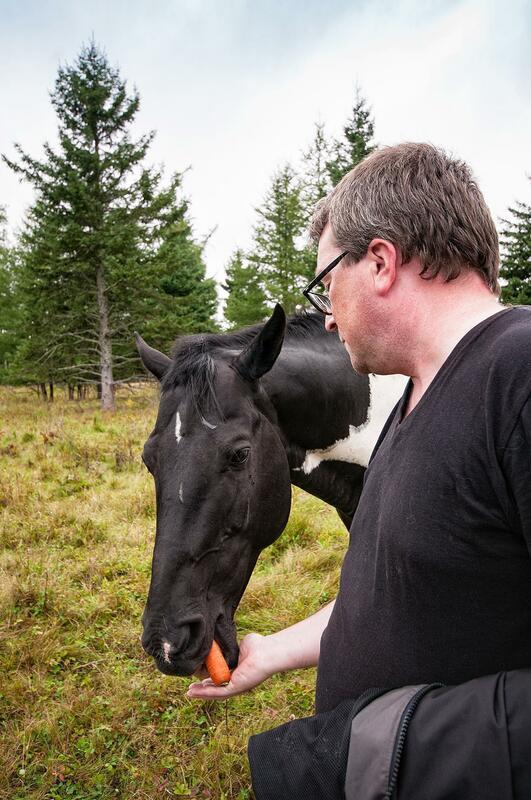 They were gentle and exceedingly friendly. One insisted on following my mom around and laying her goat head on mom’s leg. I’m pretty sure this goat gal wanted to go home with my mom. 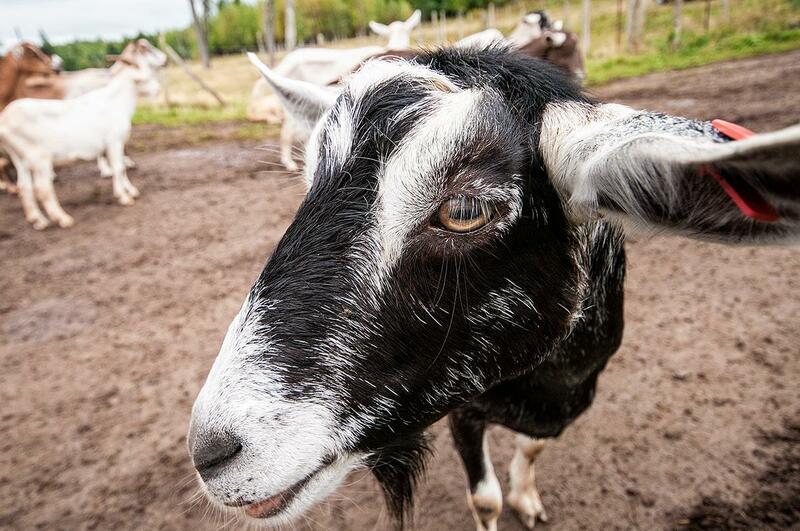 Overall, a visit to Au Fond du Bois is worth the trek if you enjoy friendly farm animals and great cheese and is well worth visiting if you’re visiting Kouchibouguac (just don’t try to take your motorhome down the dirt road). And, if like us you’re struggling through the pasteurised cheese desert of New Brunswick, make your way to your local farm market and ask for Fromagerie Au Fond du Bois. You’re welcome. Looking for a place to stay nearby? 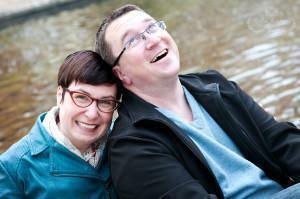 Check out Booking.com’s top picks for the Bouctouche area.